It is fashionable these days to quote Luxemburg’s ideas and positions, especially in her polemics with Lenin. However this return to theoretical and critical Luxemburgism has mainly been carried out by those who have learned nothing from her real thinking or her heroic militancy. 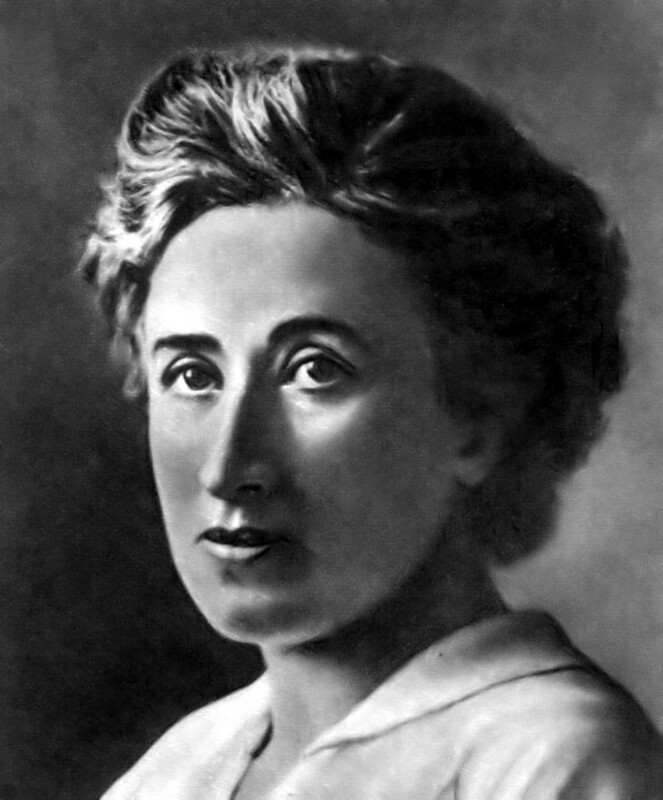 They reinterpret her formulations on freedom and democracy in their own way, and mostly for devious motives, whilst for Luxemburg these expressions serve only as a catalyst for the growth of revolutionary consciousness in the masses as they struggle for emancipation. However, on the lips of some enlightened bourgeois and renegade socialists such ideas are useful for dragging the proletariat into the capitalist mindset and the political and economic structures of the ruling class. The attempt to use Luxemburg’s polemics as a front for the most decrepit and dishonest anti-communism stemming from the Second International and the Two and a Half International, does not deserve special attention. On the other hand, having another look at this same material, a product of the polemics with Lenin, and of the key problems of the party and of the dictatorship of the proletariat as presented and confirmed in the Russian experience, is very timely and fruitful. At the root of her disagreement with Lenin were the same ideas that are re-emerging today in the politics of the avant-garde of the international labour movement, except that today they are sharper and more dramatic given the defeat of that burning test of socialism which was the Soviet experience. The disputed issue initially seemed to focus on organising the party and democratic centralism, but expanded and deepened into a discussion about the nature of the workers' state and more precisely, that of the dictatorship of the proletariat, as it appeared in Lenin’s time. It is precisely because of the polemics of that time between the two major theorists of Marxism, and the subsequent critical re-examination of the living experience of the Russian proletariat, that today we have some clearer ideas about the issue of that dictatorship and its most sensitive instrument, the party, as it leapt from the pages of theory into real life, and into history. Everyone recognises the part spontaneity plays in the workers' struggle, but it alone is not enough to ensure the continuity, unity and concreteness of that struggle. Everyone can agree on the need for a spirit of solidarity of initiative and a growing knowledge and consciousness of their own tasks, or the tendency to overcome the limits of individual egos and sectional interests in order to have a broader and more unified sense of class. In this sense the international proletariat has taken unprecedented steps, corresponding to the degree of historical evolution of capitalism’s technology and organisation. But whoever observes this slow self-formation of the proletariat cannot fail to notice that the masses assume class consciousness through struggle and organisation; the unorganised masses, or those for whom politics is an alien activity, are less sensitive to problems of their own class and more reluctant to struggle. But struggle is first of all a problem of power and organisation, and organisation always involves discipline, hierarchy and the exercise of authority proceeding from the top to the rank and file; the phenomenon is all the more obvious if we pass from mass organisations to those of political parties, and within those parties to their omnipotent apparatuses. The plague of the bureaucratic regime has tainted all sectors of social life. Taking this into account, Lenin thought of the class party as a fighting organisation based on democratic centralism, on the power of a homogeneous central committee and on a solid network of professional revolutionaries; a party conceived as a conscious tool of history, the interpreter and protagonist of events. Such a party brings with it the dangers of authoritarianism, of politics from above, of place men and therefore of opportunism. But in Tsarist Russia, in the years of clandestine work and in the white-hot phase of the insurrection, no other party but the Bolshevik Party was possible, just as Lenin had conceived and fashioned it. Such is the unlimited trust that Luxemburg placed in the mass of workers and in the creative capacity of their social and political struggles. But Lenin didn’t put forward a different view, nor did he have less trust in the working masses; only that instead of the myth that this in itself was enough, he substituted the need for a strong, centralised party, a secure and irreplaceable guide of the masses in the revolutionary struggle. Now we do not ask ourselves what was the right way; we just note the dialectical contradiction in the tragedy of the German proletariat, politically the fiercest in terms of its ideological weapons and organisation, which in the moment of the highest revolutionary tension of the first post-war period, was unable to produce a sure guide. This had the following consequences: the Spartacist movement failed in January 1919 as it was unable to link its revolutionary initiative to the action of the masses; the insurrectional attempt of the Berlin communists failed in 1921; in 1923, the German Communist Party, born from the heroic Spartacist nucleus did the same because it was subservient to an international centre already sick with opportunism. The only positive element on which those who polemicise about Luxemburg are silent, but in which her revolutionary heart rejoiced, was the victory of the Bolshevik Party. This time the party-instrument had acted in harmony with the objective conditions, promptly and with adequate means, firmly tied to the interests of the great masses of workers in revolt. Later the dialectical contradiction found the same Bolshevik Party, armed with the same method, the same phraseology, even with the same personnel, passing over to the armed defence of interests and institutions opposed to those for which it had fought at the head of the Russian and international proletariat. It would finally arrive at the absurdity of labelling the construction of the most monstrous state capitalism as socialist. Action is therefore not decided unilaterally from top to bottom, nor even just from the bottom upwards. Both are equally capable of making decisions, since in reality the organisation can only function and develop through their harmonious interdependence. Workerism, voluntarism, and the very laws of spontaneity are all inadequate for class historical purposes and therefore for revolutionary activity. Equally inadequate is any idea and any tactic based on mechanical determinism, or on the notion that a party-demiurge might one day be delegated the task of carrying out the revolutionary rupture by a working class emptied of its historical function and considered as a simple brutish mass pushed into the fight by who knows what thaumaturgical force of leadership or Central Committee. In reality, the party in every phase of its action and in every instance interprets and harmonises the united action of the class without which every party would fail in its task and revolution would just be a meaningless word. In other words exactly as happened in the Bolshevik October, with the return from top to bottom, of the will of the party toward the enormous explosive force of the class which had originally created that will. In Luxemburg’s thinking the idea of freedom is fundamental to her view of workers’ democracy; for her the issue of authority and of dictatorship has to be seen in this way or we are left with a tyranny at odds with that revolutionary idealism and unlimited political freedom which is a distinctive sign of the dictatorship of the proletariat compared to any other dictatorship. Here is the real meaning of the dictatorship which is about the manner in which democracy is applied and it is a product of the growing political education and self-formation of the working masses. To be sure authority and freedom appear irreconcilably contradictory, if taken in the abstract and in themselves. In this sense the dictatorship is always a unilateral, authoritarian and violent affirmation that denies freedom to those who think differently; and they think differently, we would add, because they are the bearers and defenders of interests different from those that the dictatorship supports and defends. Such is Lenin's teaching that springs from the harsh experience of the early years of the October Revolution. But it took years of experience in the living body of workers' struggles to make this point of convergence between theory and political reality clear. Here we can see the same dialectical relationship that we saw between party and class. The party justifies itself and answers to its historical function if it operates in the class as the driving force of the revolution in accumulating experience, revolutionary theory and potential for power, just as the class has been doing in its daily struggles against capitalism. The dictatorship of the proletariat of tomorrow, wherever it takes place, will be a new experience in the sense that it will reconcile the intuition and revolutionary optimism of Luxemburg and the irreplaceable hard teaching of Lenin. We will have a synthesis of authority and freedom, with the development of ever more active workers' democracy in the dictatorship. This will be all the more terrible and inflexible as the dense and vindictive forest of bayonets will arise around an international capitalism that does not want to die, whatever the costs, even if it is already dead as a historical experience. In revolution, as in war, it is about breaking the will of the enemy. The degree of intensity of the struggle depends on internal and international conditions. The more ferocious and dangerous the resistance of the vanquished class, the more pressure on the system to turn to terror. Luxemburg never disagreed with this policy. She just thought that the weapon of the struggle would be all the more valid and legitimate from the point of view of the revolution, the greater the consciousness of the proletariat that wielded it. And how much more direct and decisive would its presence be in the struggle to build a socialist society and for its defence from both internal and external class enemies. This is the only condition to avoid the personal dictatorships or apparatus, whether as tragedy and farce, imposed on us in the name of a Stalin, a Khrushchev or even a Togliatti. 1. Organisational Questions of Russian Social Democracy, translation slightly improved using the Italian. So today maybe the ''perhaps'' in the above text of ''....and perhaps even when Lenin was still alive.'' can be omitted since there is surely no question that the degenerative process was already underway during Lenin's lifetime, for reasons both 'objective' and 'subjective'. More apologetics for Bolshevism from a semi/soft-leninist stance, a common occurence on libcom recently. These views and political models are stuck so far in the past - even their imagery is unimaginative & archaic; "the dense and vindictive forest of bayonets will arise around an international capitalism that does not want to die." Its a historical document from the 1950s (when BC made the first Italian translation of Luxemburg's work I believe) so we are not in a position to change its language. Bolshevism was both a product of the revolutionary class and also its ultimate gravedigger which makes the whole sorry final saga even more tragic. It would make a lot of sense to put an original publication date on articles like these so readers know its historical context. Bolshevism was as much a product of the left of the disaffected Russian bourgeois intelligentsia. Agreed. We actually put this translation up before we intended as we suddenly realised it was the anniversary of Rosa Luxemburg's birth. We'll dig it up; The greatest impulse to Bolshevism in 1917-18 was its worker-organiser base which was why the other mainstream "socialist" parties looked down on their stirring up of those "dark forces" from below (and all the Russian parties were led by the intelligentsia which given the educational opportunities of the time is quite understandable).